There’s a continuum of narrative duration which captures the breadth of storytelling. Huge novel cycles (Les Rougon-Macquart by Emile Zola [1871-1983)] or Marcel Proust’s Remembrance of Things Past [1871-1922]) in literature, and massive cinematic works (Rainer Werner Fassbinder’s fifteen-hour Berlin Alexanderplatz (1980) or Claude Lanzmann’s nine-hour Holocaust documentary, Shoah ) constitute the apotheosis of long-format narrative. The relationship between cinema and photography seems distant, the former a time-based medium and the latter most distinctly not so. In Henri-Cartier Bresson’s famous formulation, photography freezes time: a great still image is taken at the “decisive moment,” discarding what comes before and after the artwork presented to us. Weiner’s audio-visual short story, “Panorama” grapples with the metaphor of death linking cinema and photography. The episode concerns a Mexican reporter, Abel (Juan Pablo Castaneda) who conducts an investigation into a disreputable medical clinic which merely delivers placebos to doomed, rich clients. Abel falls in love with Victoria (Radha Mitchell), a woman whose son’s Romanov heritage includes incurable hemophilia. Victoria’s linkage between Mexico and the Italian Renaissance invokes the fascinating work of the German photographer, Thomas Struth. 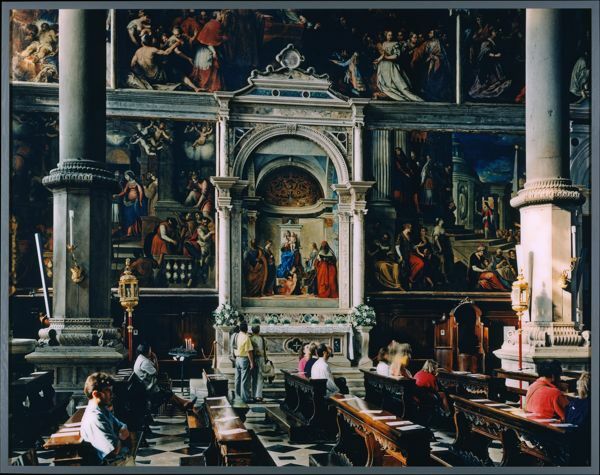 In a startling 1995 image, Struth depicts the San Zaccaria church in Venice, whose centerpiece is an altar behind which hangs a masterpiece, a Madonna holding the Christ child painted by Giovanni Bellini in 1505. While Struth frames the Bellini in the center of his image, he shoots from such a distance that the foreground, one third of the image, depicts tourists with cameras who have come not for a religious experience, but an art historical one. Like Struth, Weiner examines not so much the artwork inside the cathedral itself, but rather how and why people look at the art. The moving audio-visual nature of Weiner’s show dovetails with Struth’s still image. Weiner pursues this connection further. Abel takes Victoria and her son to see Diego Rivera’s painting, “The History of Mexico” (1935) at the National Palace. The mural depicts the entirety of Mexico’s history, from the Aztecs and Mestizos, to the Spanish conquistadors, to the French invaders in the 19th century, to the Mexican peasant revolution of Emilio Zapata and Pancho Villa. 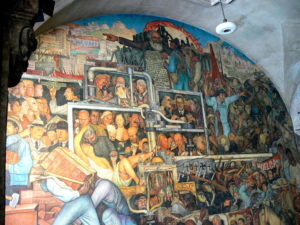 The mural includes Karl Marx holding the Communist Manifesto and Rivera’s famous artist wife, Frida Kahlo. Late in the episode, Abel delivers his exposé to his editor. His boss hates the writing: “It’s not a story; it’s a poem, or something… It’s God awful…. You’re a terrible journalist.” Indeed, Abel is a poet, not a journalist at all. Rather than an extended investigative story of the corruption at the medical clinic, Abel’s story is one about a moment in time when he falls in love with Victoria. Indeed, the episode opens with a visual introduction to Mexico City accompanied by Abel’s poetic voice-over narration about the nature of love. 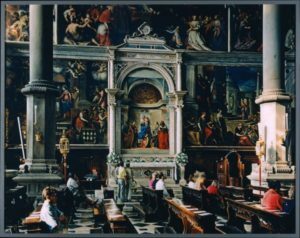 Weiner’s episode climaxes in an inversion of the down-conversion of moving images into the still artwork in the cathedral. In a final long take, the Rivera mural comes to life. Abel walks forward through the square. The camera begins dollying backwards to keep Abel in the center of the frame. Like the Struth photograph come to life, tourists in the foreground populate the square around Abel. 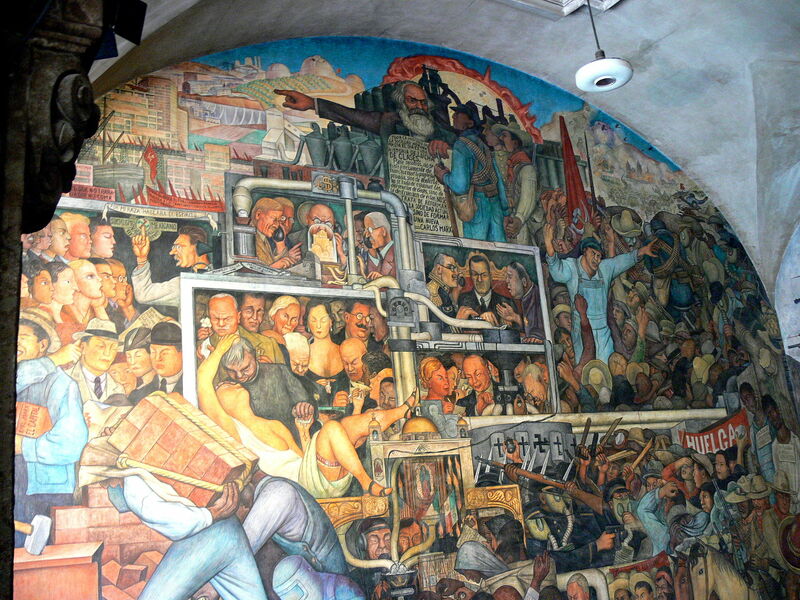 The various figures in Rivera’s mural also walk past Abel: native peoples, the Spanish conquistadors, the 19th century French invaders, and peasant revolutionaries populate the image around Abel. Finally, a line forms on both sides of this love-struck poet. To his left, Frida Kahlo and Karl Marx join Abel’s walk from the past into the future. Behind them, peasant revolutionaries hold a red banner, “Huelga” (“Strike”). The camera tilts upward. The episode ends with the blank white sky above the square. This ending produces a remarkable single effect. Bringing the mural to life allows Weiner to demonstrate how history overlaps on top of itself, one moment in the present co-existing amidst the entire history of Mexico. The metaphor of the panorama ceases to be bound by the confines of the still image. The audio-visual production of moving images creates a time-based panorama, in which the history of Mexico overlaps with Abel’s present, and an unknowable future. This method is of course descriptive of the entire project of The Romanoffs. The son’s hemophilia, a perpetual legacy of the Romanov genes, refuses to lie dormant in the past, instead producing Kracauer’s death’s head. Racked by intense guilt, precluding a romance with Abel, Victoria cannot forgive herself for condemning her son to death. Like Rivera’s mural, The Romanoffs studies the devastating effects of the transposition of the past onto the present, a gesture which leaves very little hope for the future. The camera cannot bear to remain on the ground with Abel and Rivera’s ghosts; instead, it tilts up, not toward God, but oblivion.